Screenshot from Steve McQueen: The Man & Le Mans (2015). Directed by Gabriel Clarke & John McKenna. Courtesy of FilmRise (USA), Marco Polo Production (France), The Works UK Distribution (UK). Back in 1970 actor/style icon Steve McQueen launched production on a film called Le Mans, a project that centered on the annual 24-hour Le Mans auto race in France. For the actor, who’d recently been THE star of hits The Thomas Crown Affair and Bullitt, this was his first deeply personal work. 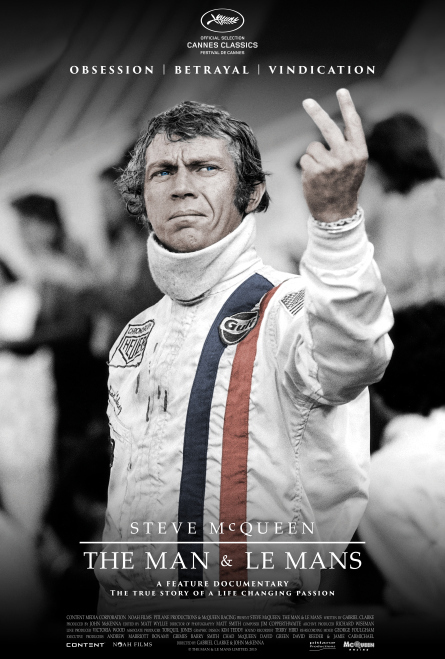 Unfortunately the production was hit with a series of problems, including injury-inducing car crashes, onset rivalries and budget issues; and the film, which came out the next year it was widely panned by critics and largely ignored in theaters Cut to 45 years later we have a new documentary, Steve McQueen: The Man & Le Mans, that recounts this period of the late McQueen’s life, revealing new facets of him as both of a person and an entertainer. In the documentary interviews with McQueen’s son Chad, who has also raced cars and was a kid during the making of Le Mans, as well as his ex-wife Neile Adams, give a broader sense of who McQueen was off-screen. It’s a fascinating watch for anyone who is interested in the actor’s career, but it’s also a compelling look at what it means for a successful actor to grapple with failure as well as passion projects. Ironically, the year before, James Garner had made a similar film called Grand Prix with John Frankenheimer, and the fact that another actor had made an inferior work about his love angered McQueen (according to a friend in the film, McQueen, who lived in the apartment above Garner, would piss off his balcony into the actor’s flower bed.) John Sturges, who had directed McQueen in The Magnificent Seven and The Great Escape, would helm the picture, written by Alan Trustman, the screenwriter of Thomas Crown Affair and Bullitt. Think about that for a minute. The director and writer of McQueen’s most notable films to date were behind him on a film about which he felt most passionate. It seemed impossible for Le Mans to fail. “Steve McQueen: The Man & Le Mans” is an interesting documentary because it approaches its well-known subject from an unexpected angle. Much like the racing documentary Senna, it uses one situation before expanding out to get into the mind of a true gearhead as they pursued their passion as opposed to a traditional bio-doc. And interviews with those closest to him, including son Chad McQueen and ex-wife Neile Adams, illuminate this well-known star in a new way. And yet what’s most captivating about “The Man & Le Mans” is that footage from the film—seeing what a driver sees on this infamous race; seeing that about which McQueen was so passionate about capturing on film. It has less to do with the actual movie that was made itself than a real peak into what it means to be passionate about cars and racing. The man behind the wheel is what it’s all about and it is essential viewing for any automotive enthusiast. See this movie. We think Steve would have liked it that way.